The 51st legislature of the Student Government Association (SGA) convened on Monday to approve Emory Entrepreneurship and Venture Management (EEVM)’s request for executive agency status, deny Emory International Relations Association (EIRA)’s request for executive agency status and reject a bill that would have reduced the number of graduate students on the Constitutional Council. SGA also renewed the Student Programming Council (SPC)’s and TableTalk’s executive agency charters and passed bills to fund the “First-Year Farewell” celebration and to establish a data collection system for student groups. To be considered for an executive agency charter, an organization must demonstrate that they serve all undergraduate divisions with no more than 66 percent representation for the College of Arts and Sciences. The legislature voted unanimously to charter EEVM as an executive agency after EEVM Co-President Ayushi Ashar (18B) spoke to SGA about why EEVM was requesting an executive agency charter. Ashar distributed a packet that contained letters of support for EEVM’s executive agency charter application from Associate VP for Finance, Administration and Operations David Clark; BBA Council President Grace Cleland (18B); Vice Provost for Strategic Research Initiatives Lanny Liebeskind; Resident Hall Association (RHA) Council President Aaina Pahwa (19B) and Oxford SGA President Ben Palmer (18Ox). Ashar said that EEVM’s current College Council (CC) charter does not allow EEVM to have strong participation from students in other divisions. CC requires that more than 66 percent of chartered clubs’ members are enrolled in the College. EEVM also has trouble funding their bigger events such as the HackATL conference, Ashar said. Neibart noted that EEVM had to attend a CC supplemental budget hearing council every week leading up to HackATL and fundraised the rest. In Fall 2017, EEVM spent more than $22,000 but only received about $6,200 from CC. EEVM made up the difference in funding through fundraisers, corporate sponsorship and grants from Campus Life, Ashar told the Wheel. Speaker of the Legislature and Senior Representative William Palmer (18C) noted that clubs at other universities receive funding from departments and not from student activity fees, like Emory. Citrin said she didn’t want the issue with CC to happen again and wanted “a more steady funding even if it doesn’t increase” in order to help alleviate the financial burden EIRA club members have due to Model United Nation conference costs. SGA Vice President Natasha Armstrong (18B) expressed concern that EIRA was only coming to SGA for an executive charter because of their conflict with CC and not because they serve all undergraduate divisions. Neibart agreed with Armstrong and said the issue was “a miscommunication with the [College Council] VP of Finance.” Neibart advised legislators not to consider the club’s challenges with CC in their decision on whether to grant executive agency status. Sophomore Representative Johnna Gadomski (20C) did not believe that EIRA was only coming to SGA because of its conflict with CC. She said the club was becoming “more renowned nationally” and weren’t getting the funding they needed to fully participate in Model UN conferences. “The structure of College Council and the way that the supplementary hearings work isn’t working for them, and it’s making it infeasible for them to accomplish their mission,” Gadomski said. While SGA legislators debated whether or not EIRA needed an executive agency charter, Freshman Representative Austin Graham (21C) said the answer depended on whether legislators wanted SGA to be a more proactive or reactive type of government. “Do you want to set a precedent that says, ‘We will help you. Become an executive agency so that you can reach out to students outside your original divisional council’? ” Graham said. “Or do you want a student government that says, ‘When you meet these criteria, we will let you do this. But until then you can get there, you’re just going to have to deal with it’”? 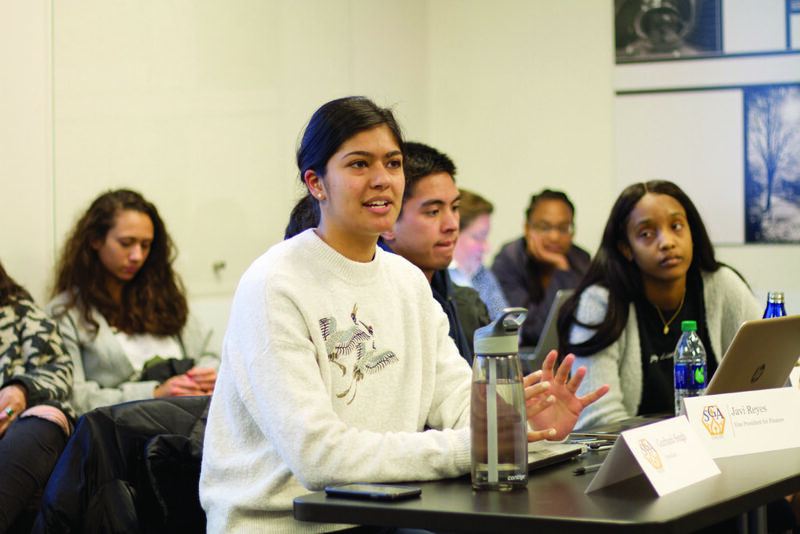 In response, Junior Representative Madelyn Zapata (19C) said SGA generally would support bills so they can be passed whether now or in the future, but Zapata also said that “[SGA] still has guidelines.” Palmer also noted that EIRA surpases CC’s requirement of needing more than 66 percent of club participants to be from the College. EIRA’s executive charter was rejected with seven voting no, three voting yes and one abstaining. SGA rejected Bill 51sl58, which would’ve changed the number of graduate student representatives on the Constitutional Council from eight to four. The change would result in four graduate and undergraduate student representatives on the Constitutional Council, which creates an “equitable representation on the Constitutional Council to reflect new student government, according to the bill. The bill needs to be passed twice and was passed once in their last meeting. Attorney General Elias Neibart (20C) said legislators should “vote down the bill” because the Constitutional Council instead wants to become two separate organizations that serve either undergraduates or graduates. SGA President Gurbani Singh (18B) further elaborated saying there was confusion after the split over whether all or some branches in student government would split. Neibart recommended that the next SGA legislature codify the function of the Constitutional Council. The bill failed with two voting yes and seven voting no. SPC President Tamara Ezzat (18B) and SPC Vice President Abbey Kelly (19B) presented the case for SPC’s executive agency charter renewal. Ezzat said SPC’s mission is “improving student life and the quality of entertainment on campus by creating a better experience through our [student organized] events.” SPC aims to have one or two student events each month. Legislators voted to renew SPC’s executive charter unanimously with nine votes. TableTalk Co-Presidents Christopher McDougal (19C) and Samantha Zeurcher (19B) pressed SGA to renew TableTalk’s executive agency status. TableTalk’s mission is to provide “a framework for conversation between people who would not interact under ordinary circumstances,” according to TableTalk’s executive agency annual report. The organization has four branches: TableTalks, which are “planned conversations between two disconnected groups, CampusCouches, which sets up couches around campus for people to sit and have “unstructured conversation,” TableTalk[X], which conjures new ways of promoting a “culture of conversation” and Media and Arts, which handles advertisements and art promotion. TableTalk hosts more than 25 different events that serve hundreds of students, Zeurcher said. For the three years that TableTalk has existed at Emory, the organization has increased membership by 30 percent each year, according to Zeurcher. When asked about the number of undergraduate students that attend TableTalk’s events, neither McDougal or Zeurcher could produce a statistic. McDougal said they would be using card readers to collect data on student participation for the next event, Couchella, which is an “an Emory music and arts festival (this year sponsored by TableTalk, CORE, Good Vive Tribe, Emory Arts Underground, and the Pulse) taking place in Asbury Circle,” according to TableTalk’s Facebook post. Graham was “disappointed” that TableTalk’s participation rates were not in their presentation, but Palmer said it was hard for the club to collect data because of the informal nature of their events, such as CampusCouches, where students are supposed to sit on the couches and talk. SGA approved TableTalk’s executive agency charter renewal unanimously with nine votes. Bill 51sl51 requests $486 to fund the “First-Year Farewell,” which “celebrates” the end of the first year experience at Emory. The bill was introduced to the legislature on March 6. The Complex President Lori Steffel (21C) said that although RHA receives a lot of funding, the budget does not allocate enough funds for this newly planned event because the group has already allocated its funding to pre-planned events. Neibart showed apprehension about funding the bill since SGA has previously showed concern about overspending. Graham, who received budget numbers from SGA Vice President of Finance Javi Reyes (18B), said SGA started with $113,000 in August 2017, has since spent $30,823 and currently has around $80,000. Zapata said the bill asks for a reasonable amount of funding and acknowledges that Steffel has exhausted other resources. Palmer also stated that the event would happen whether or not SGA funded the $486. The bill passed unanimously with nine votes. Singh proposed Bill 59sl59, which creates a data collecting system to be used by student groups. The goal of the data collection is to “mandate all undergraduate clubs and organizations to record attendance, membership and participation at events in which the student activity fee is used,” according to the bill. Legislators had previously heard Singh discuss the bill in a previous meeting. SGA held a joint-session with GSGA that lasted about 10 seconds. SGA and GSGA are required to convene once every semester due to the new requirement after the SGA-GSGA split but there was nothing on the agenda to discuss. CORRECTION (3/28/18 at 11:53 a.m.): The article has been updated to properly reflect that EEVM refers to Emory Entrepreneurship and Venture Management.